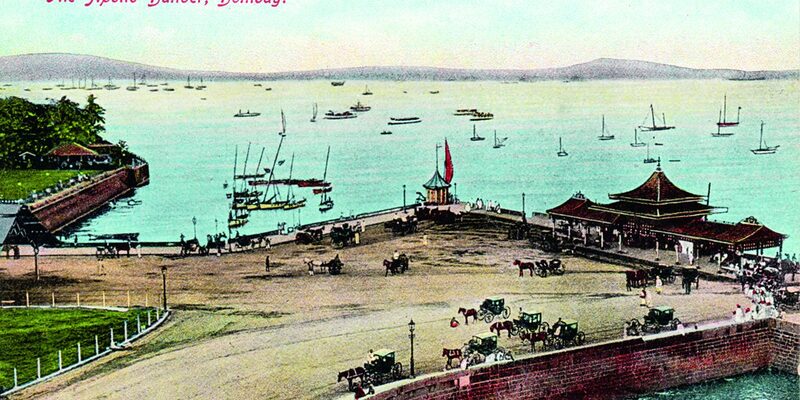 Postcards are the first and only mass-scale colour views made by people a century ago. 'The Apollo Bunder, Bombay'. G.B.V. Ghoni [? 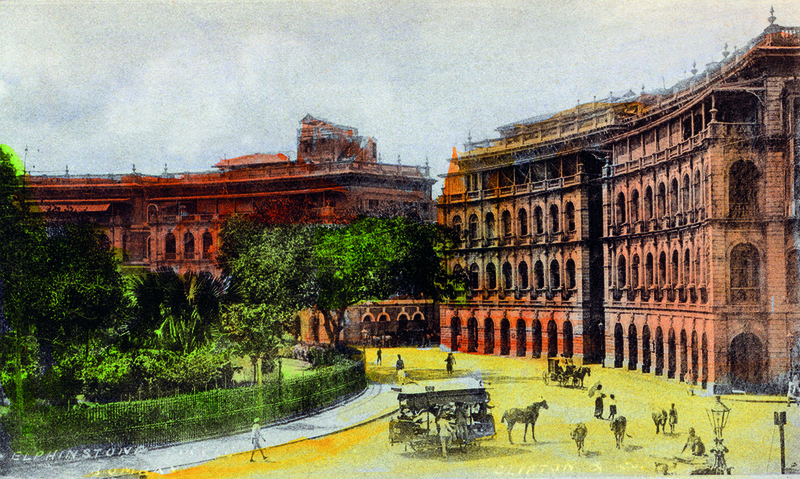 ], Mumbai, c. 1905. Coloured halftone, Divided back, 13.75 x 8.75 cm, 5.41 x 3.44 in. It all began with Women Baking Bread. I was at my first postcard show in Concord, northern California, when the beauty of this little court-size card struck me. It carried me back to 5 Queens Road in Lahore, where my grandmother and a servant girl crouched on the veranda of a dilapidated mansion, chatting and making chapattis to be carried across the courtyard and cooked in a clay oven with straw awnings and charred wooden beams. It caught the warmth of that place. I marvelled at the tromp l’oeil on the postcard of the lantern and cloth, so effortlessly did they float above the women depicted. I bought the postcard. It is one I have rarely run into again, but I have since found many signed by the same artist, Paul Gerhardt, the search for whom is one of the things that propelled this book. His career shows how creatively driven the postcard medium was in its earliest years. Women Baking Bread began a twenty-year collecting spree that is far from over. Postcards are barely collected by institutions; they are in the hands of private collectors, families, and increasingly, online exchanges around the world. Postcards are being flushed out of albums and attics, and the interactions that ensue have made finding and analysing them a delightful window into history. They have been skipped by most historians, in part because they have been so inaccessible. 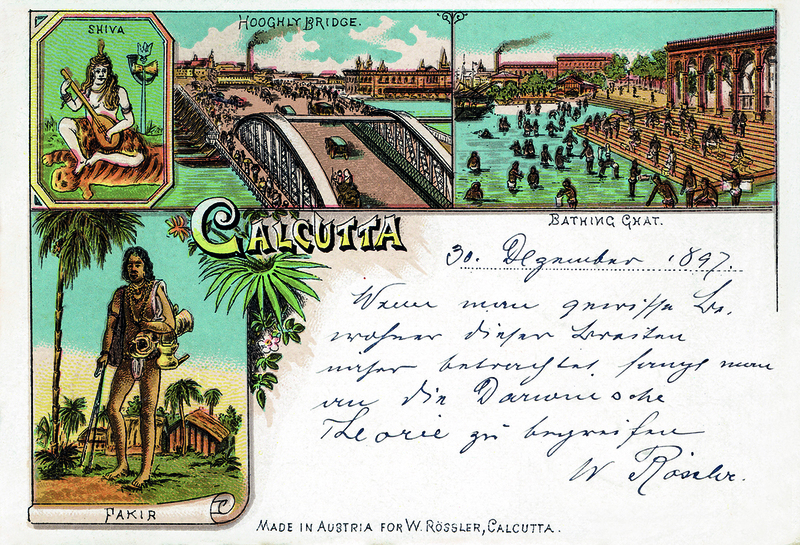 The story of the picture postcard in India is closely intertwined with that of Germany and Austria, where the image postcard was invented and most of them were first printed. 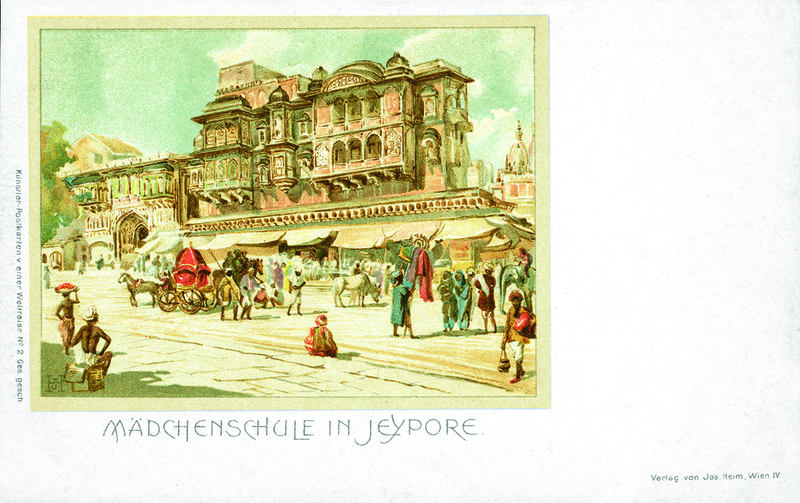 I grew up in Vienna, Austria, where I discovered that the earliest artist-signed postcards of India were made. Knowing German has led me to archives and dealers, and even a lithographic print shop in Vienna that still had a stone-plate printing press upon which early postcards were manufactured in the basement.. It has taken me back to what was my home for the first 13 years of my life, before we moved to Islamabad, Pakistan. Recognizing the cross-cultural ping pong between the subcontinent and the West as played out in the story of these cards has been one of the most rewarding threads pursued in this book, an echo chamber of my own Pakistani and European roots. ‘Victoria Terminus G.I.P. Ry. [Railway] Bombay’. G.B.V. Ghoni, Bombay, 1899. Coloured halftone, Undivided back, 13.75 x 8.65 cm, 5.41 x 3.41 in. Calcutta Shiva, Hooghly Bridge, Bathing Ghat, Fakir. W. Rossler, c. 1897. Lithograph, Court-size, Undivided back, 12.25 x 8.45 cm, 4.82 x 3.33 in. A postcard is always on its way. My interest in them deepened after my first book, From Kashmir to Kabul, was published in 2002. I needed to get away from the monotone of sepia images, to get to colour. Postcards offered that in so many ways, with each process used to introduce colour, from painting to stencils to stone plates, offering its own pleasures. Postcards are the first and only mass-scale colour views made by people a century ago. They are more numerous and less expensive than albumen prints. They cover a lot more ground. A new beautiful century-old postcard can pop up on any day. Murree. 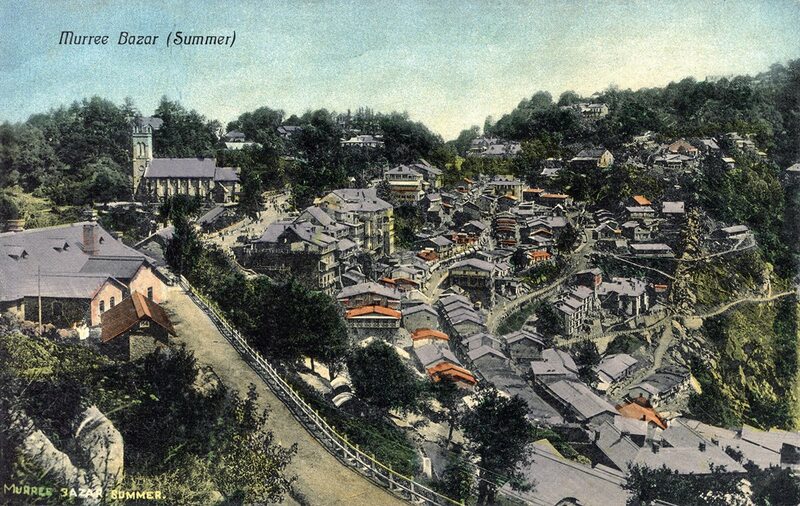 Bazaar (Summer). D. Baljee & Co., Murree and Rawalpindi, 719 [Verso], c. 1905. Coloured collotype, Divided back, 13.95 x 9.05 cm, 5.49 x 3.56 in. Madschenschule in Jeypore [Girl’s School in Jaipur]. Artist Cards from a World Tour 1898, #2. Josef Hoffmann [signed], Joseph Heim, Vienna, Austria, 1898. Lithograph, Undivided back, 14.15 x 9.01 cm, 5.57 x 3.55 in. Indien shows a visit by German Crown Prince Ferdinand to India in 1911. It represents an apotheosis of the form, with the palm tree and the elephant brought together with magnificent design effect. Note the carefully arranged back of Indien, with the stamp of the German heir just across the profile of his cousin, the British monarch. The two men were on the brink of stumbling into World War I. Sanctions a year later cut deeply into German postcard production, the ensuing war destroyed many manufacturing facilities, and when it was all over in 1918, popular taste had shifted decisively to telephones, movies, records and radio. As I was to discover, the picture postcard has also always been more of a German-speaking thing. Even in the US, where I now live, German-Americans were the largest part of the golden-era postcard market. Elphinstone Circle, Bombay. Clifton & Co., c. 1903. Handcoloured collotype, Undivided back, 12.1 x 8.8 cm, 4.76 x 3.46 in. Postcards were “to the Edwardians what film and television are to us today” claims one writer, and as I have rolled back postcard history, I see how true this was. In 1900, a single postcard image could move thousands of miles before reaching its destination, more than almost anyone at the time would travel in a lifetime. A photograph was sent to Dresden, postcards were struck from it and shipped back to Jaipur, sold outside the Hawa Mahal, mailed from Mumbai to London, due to arrive in two weeks, a minor miracle for a few annas or pennies. Damayanti. 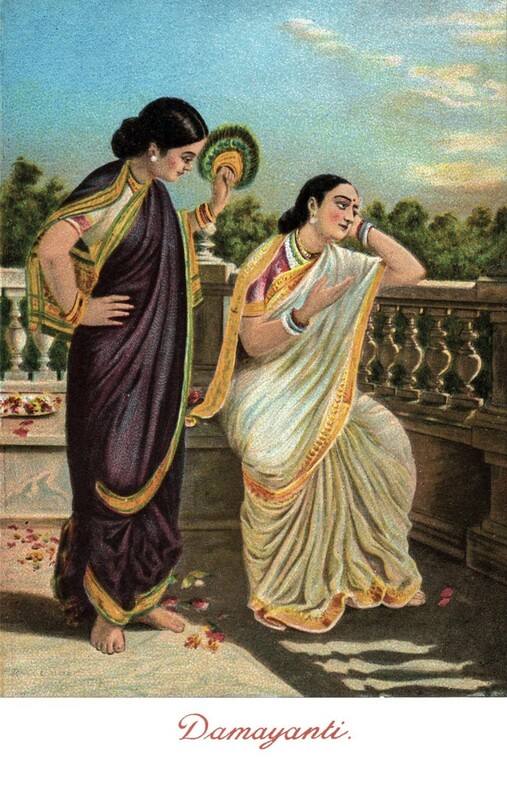 The Ravi Varma Press Karla Series No. #830, c. 1905. Coloured halftone, Divided back, 13.6 x 8.6 cm, 5.35 x 3.39 in. Picking up thick little pieces of paper that have survived intact for a century is like opening trapdoors into the past. I have been employed as a detective in pursuit of the material in Paper Jewels. There have been dangerous moments—illegally using my phone camera in the British or Austrian National Library to record discoveries too exciting to await archival copies. The joy of finding the announcement of the first artist-signed Indian postcards in an obscure journal in Vienna, or meeting the postcard collector Michael Powell in Kent who had a set of sister cards to Women Baking Bread. He also had a signed card by M.V. Dhurandhar, who, I would find, was the most inventive of postcard artists and whose work forms a major section of Paper Jewels. Speaking of Dhurandhar—my mother-in-law undertook a special mission to spirit his little-known autobiography out of the J.J. School of Art in Mumbai and have it translated from Marathi into English by a woman who knew Dhurandhar’s family. As I complete this Introduction, I am readying another trip to Vienna, where I have met an Austrian couple who have written two books on the Ravi Varma Press and have a wealth of data on this, the greatest early Indian postcard publisher and a firm run by expatriate Germans like Paul Gerhardt. If postcards were indebted to and spawned bridges (and misperceptions) between peoples, their birth was also welcomed with an exuberance similar to the high expectations for every new social media form. The stamp and cancellation on a postcard, sometimes drawn into the design like on The Mail in British India illustrate the triumph of this new form, imbuing them with the authenticity of time and place. Social media today is similar—an image sent with a message to someone specific at a certain time, yet open to friends and the world at large. India. 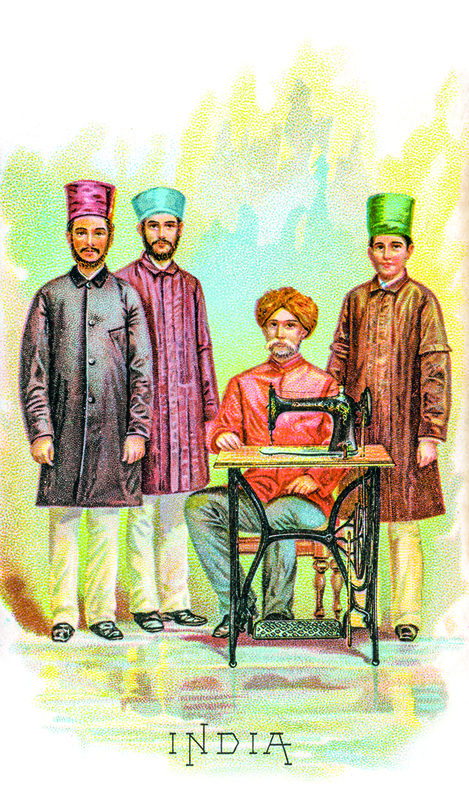 The Singer Manufacturing Co., 1892. Lithograph, Undivided back, 13.4 x 7.95 cm, 5.28 x 3.13 in. Each city and province in the subcontinent had its own publishers, artists and photographers. The axis through Paper Jewels from Kolkata to Mumbai, Karachi to Lahore, Colombo to Kandy is place. It is the filter through which I have curated the best few hundred of the thousands of postcards I have found, selecting those images that have the most personal resonance for me living in California, where postcards are pin-prick reminders of a rich cultural history left behind. A postcard contains no secrets at all, or it contains them very carefully. 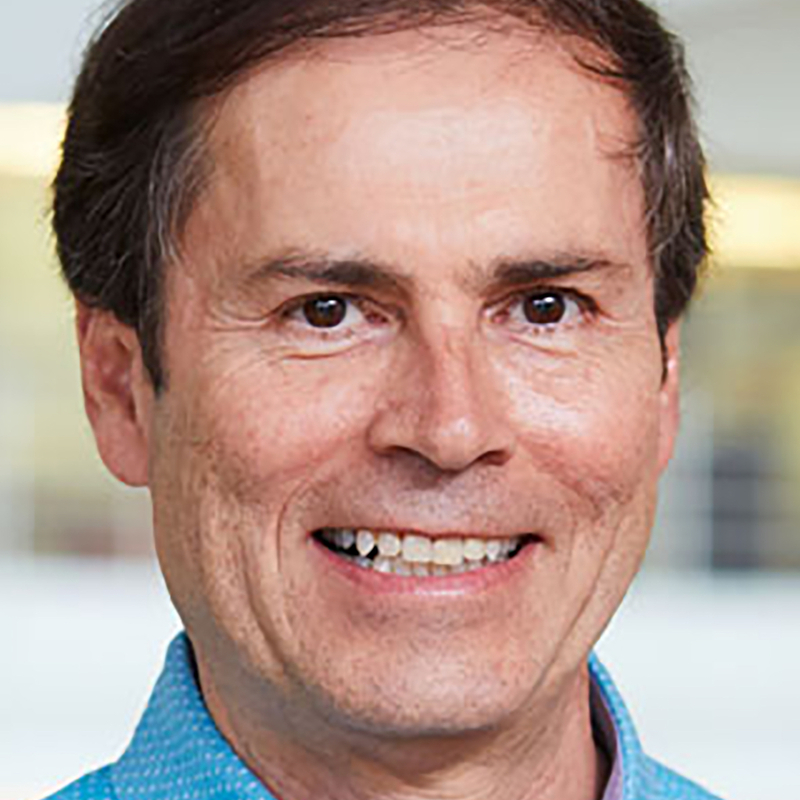 Omar Khan grew up in Vienna, Austria and Islamabad, Pakistan and is a graduate of Dartmouth College, Columbia and Stanford Universities. 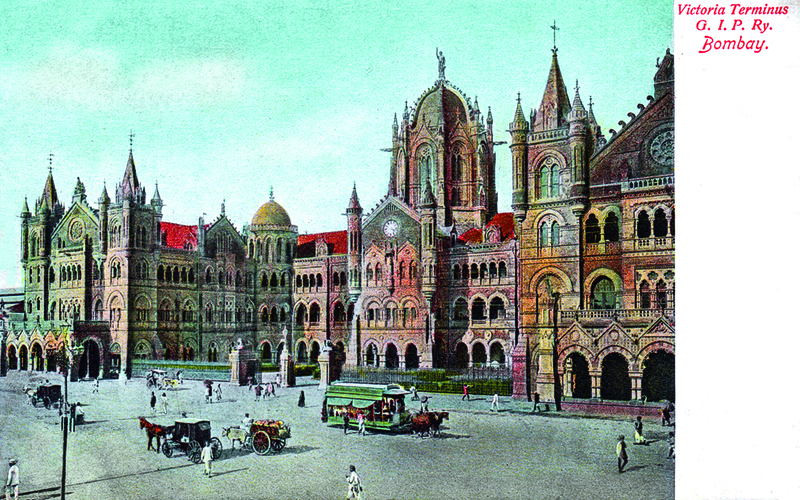 He has researched early photography and ephemera of the subcontinent for thirty years and acquired a large collection of the early postcards featured here. He is an avid historian, award-winning Web designer and aspiring filmmaker. 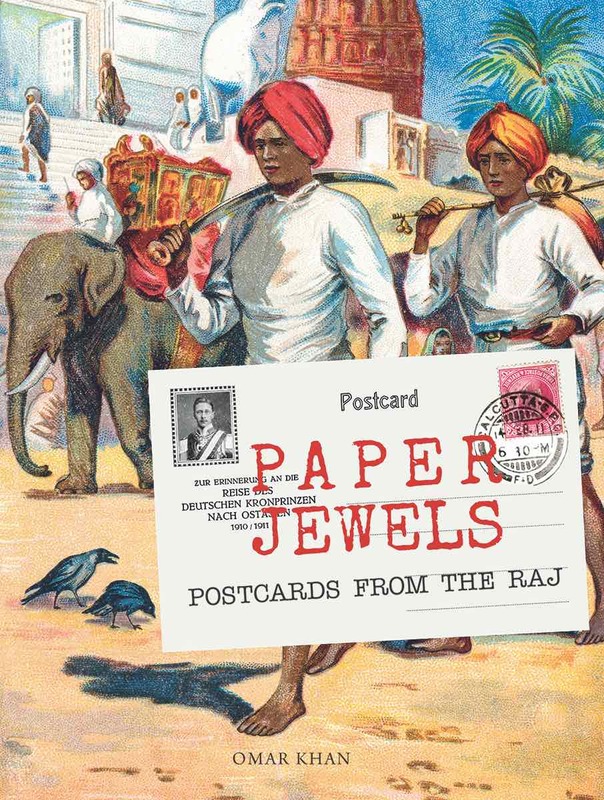 All images and text reproduced from Paper Jewels: Postcards from the Raj by Omar Khan, published by Mapin Publishing in association with The Alkazi Collection of Photography.